This was the second of a series of four abridged sets on the Columbia label. 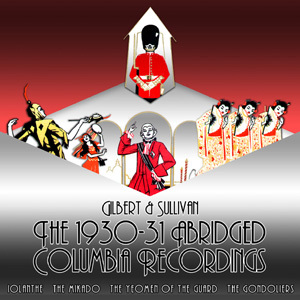 Its predecessor, The Mikado (1930), was successful, although the short span of time between them — just two months — suggests that Columbia already had a series in mind when the first set was made. The purpose of the series, apparently, was to compete with the D'Oyly Carte sets by issuing on the smaller 10" discs (as opposed to HMV's 12" discs), which could be played on less-expensive equipment. George Portland, better known as George Baker, sings here under a pseudonym, possibly to avoid offending HMV, with whom he was in effect competing. Francis speculates that some of the other singers may also have been using assumed names. However, Nellie Walker also appeared on many of the HMV sets, but sang here under her own name. Walker's connection to G&S recordings dated back to HMV's 1919 Gondoliers, on which she sang Vittoria, and extended to the HMV's abridged Gondoliers later in 1931, on which she sang the Duchess. The musicians listed above (Goosens, Draper, Brain), were not the entire orchestra, but merely three of their number whose names would have been particularly well-known. The abridged or bird's-eye album of The Mikado is followed by a similar 18s. worth of The Gondoliers in fifteen selections (Col. DB386-391). The neat album is welcome, but the book of the words is a boon that will be still more appreciated. It makes all the difference to one's enjoyment of the famous airs and choruses as sung by Sophie Rowlands, Joan Cross, Alice Lilley, Nellie Walker, Appleton Moore, George Portland, Dan Jones and William Heseltine under the baton of Joseph Batten. The whole has the Columbia hall-mark, and I need only add that for a single specimen I recommend DB389, the Regular Royal Queen quartet and Giuseppe's patter song, Rising early in the morning, neatly achieved by George Portland. "For the merriest fellows are we"
"From the sunny Spanish shore"
"Bridegroom and bride!" into "When a merry maiden marries"
"Then one of us will be a queen"
"Rising early in the morning"
"Take a pair of sparkling eyes"
"Here we are at the risk of our lives"
The Gondoliers is the only one of the Columbia sets for which the matrix numbers seem to have been assigned in the order the sides were recorded. Hence, by sorting the matrix numbers one can determine the sequence of the recording sessions. For the other three Columbia sets, the matrix numbers were pre-assigned in the issue sequence, and it is impossible to determine the recording sequence in a given session (although we do know the dates, per Francis). Take numbers are separated from the base matrix numbers by a hyphen (i.e., "-1" or "-2"). From the table below, we see that the company recorded The Gondoliers over four days, with 2, 3, or 4 publishable sides completed on each day. This observation certainly puts the take numbers in question. If, as these numbers suggest, the first take was published for most of the sides, and the second take for all the others, it should have been possible to record more than 2-4 sides per session. Chris Webster reports that all of the Columbia sets were published in two versions: "laminated records which have a solid gold ring around the label; and shellac records which have the outer gold ring broken at the top by the words 'Made in England', and broken at the bottom by the record company's details." Laminated pressings never included the take number after the base matrix number. Shellac pressings often gave the take number, but not always. As published in England, the Columbia sets (except for The Mikado) did not include side numbers. They are supplied below for ease of reference. James Tappin reports that an American Columbia Iolanthe set that he owns does have side numbers, and they may have been included on American pressings of the other operas. The selections are numbered consecutively from 1 to 15, as shown above. Three of the Columbia sets are similarly numbered, but for The Mikado they used "a" and "b" to distinguish multiple selections on the same side. Francis re-orders the sides to conform to the running sequence of the opera (i.e., side 12 before sides 10 and 11). The order shown above is as issued. The set was issued in musical sequence, except that Record 5 included sides 9 and 11, and Record 6 included sides 10 and 12. Randell Jackson sang Giuseppe on side 10. George Baker sang the rest of the role.